After seeing the title of this article, you might be thinking what the heck does this mean? Trust me, I'm going to make this a short but very important article geared towards wrong thinking and how exactly the entire process starts, and ends. I have done my best to simply the process to make it easier to remember and to understand. 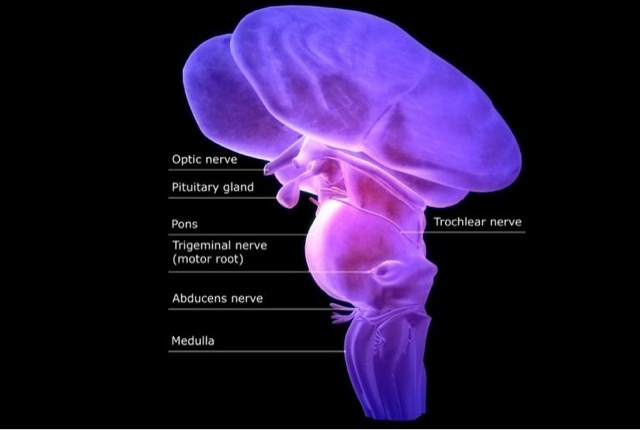 An event or experience enters the brain through a KEYHOLE called the "Medulla Oblongata." It's job, is to always ask the same question ... “what does this mean?” It kind of reminds me of an old Monty Python movie when the bridge keeper would ask one question before allowing anyone to pass ... "what is your favourite colour?" Then the little subconscious voice in our head usually opens up the bad memory files - the old videotapes and recordings of the past - and creates a new movie in our head. This new movie is kind of like Imagination TV, and after the movie begins, our 10 million nerves accept this ITV program, and then believes it to be real. Of course, it's usually old programs on re-runs. This process then leads to our feelings, and as a result, creates what we might call negative feelings. Then, these negative feelings establish a belief system for us. Once the belief system is established, we then develop a negative, or bad attitude. Going beyond the bad attitude, comes the final stage of the cycle ... bad actions and/or bad behaviour. It's that ego speaks to us and reminds us of what happened the LAST time ... "you know this isn't going to turn out right," "remember the last time you tried this?" etc. In order to stop the cycle of "bad/negatively perceived events," we must change the "source perception." We must close the bad memory files ... put away the tapes, duct tape a lid on the boxes, and see each event as NEW and FRESH. Here's how we guard the gate ... and actually make that change in our source perception ... to be more mindful of what enters the keyhole entrance and how we answer the question of "what does this mean?" So we answer the question asked of the medulla oblongata from a different perspective. We answer from our CONSCIOUS awareness and NOW perception rather than allow our subconscious memory files to apply the negative OLD bad memories to the event instead. Our subconscious mind stands ready, willing, and able to intercept that incoming signal ... And it will if we don't stop it. For some reason, we like to return to that which is familiar. It's just easier. Trust me, if you change the way you think, you’ll change the way you live. I guarantee it. See everything as a new experience in the NOW. Your job, relationships, co-workers, even commuting in dense traffic. Look back only in reference; and only if it leads to learning and knowledge of how to perceive your current NEW event or experience in a positive way. If we base all of our experiences on old bad memory results, we can't change the negative cycles and can't break free from the ITV channel. Grab the remote, and change the channel. You can't change your current circumstances by thinking back to the old patterns and archetypes.